The atypical amino acid d-aspartate is transiently present in the mammalian brain. It is abundant during embryonic phases and strongly decreases after birth, when it is catabolized by the flavoenzyme d-aspartate oxidase (DDO). 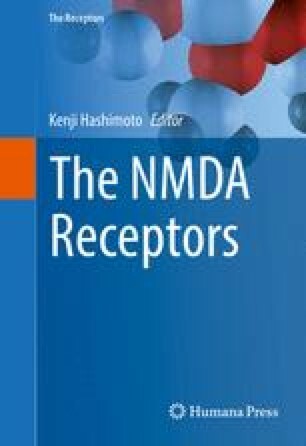 Pharmacological evidence indicates that d-aspartate binds to and activates NMDA receptors (NMDARs) and occurs at extracellular level where it is released through calcium-dependent mechanism. In the last 10 years, studies on mice with non-physiological high levels of d-aspartate have revealed that this d-amino acid is able to enhance NMDAR-dependent synaptic plasticity, dendritic morphology and spatial memory during adulthood. In line with the hypothesis of a NMDAR hypofunction in the pathogenesis of schizophrenia, it has been also shown that increased d-aspartate reduces prepulse inhibition deficit induced by phencyclidine, and produces corticostriatal adaptations resembling those observed after chronic haloperidol treatment. Moreover, greater d-aspartate levels can significantly inhibit functional circuits activated by phencyclidine, and increase cortico–hippocampal connectivity networks, reported to be altered in patients with schizophrenia. Besides studies in preclinical models, it has been shown that genetic variation in DDO gene, predicting potential increase in d-aspartate levels in post-mortem prefrontal cortex, is associated with greater prefrontal gray matter and activity during working memory. Interestingly, a significant reduction of d-aspartate content has been detected in the post-mortem brain of patients with schizophrenia, associated with increased expression of DDO mRNA. Based on the agonistic role of d-aspartate on NMDARs and on its abundance during prenatal life, future studies will be crucial to address the biological significance of this molecule on developmental processes controlled by NMDARs and relevant to schizophrenia.